The Hon. 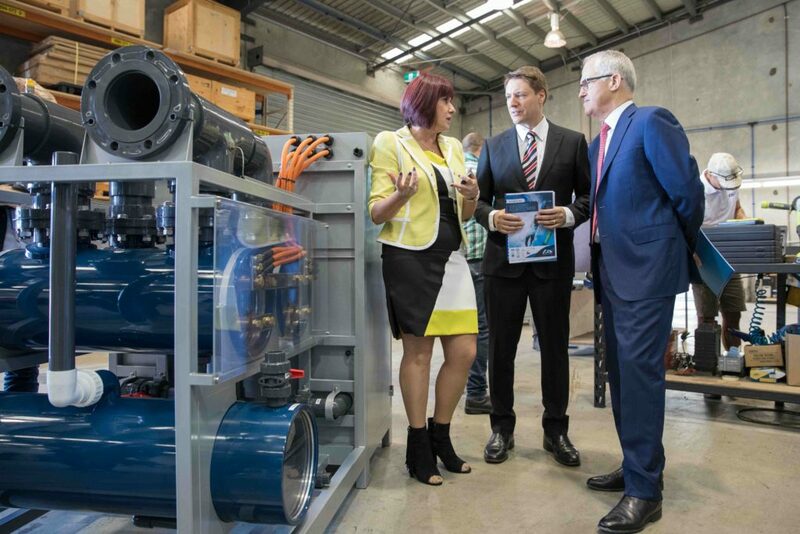 Malcolm Turnbull MP, Prime Minister of Australia, and Ross Vasta MP, Federal Member for Bonner witnessed Australian Innovative Systems’ (AIS) innovation and manufacturing excellence in commercial and residential water disinfection technology first- hand today (17.5.17) when they visited the company’s Brisbane based factory and headquarters. Mr Turnbull and Mr Vasta toured AIS’ facilities and met some of its 40+ staff, before enjoying a morning tea at AIS, attended by other leading Brisbane business identities. 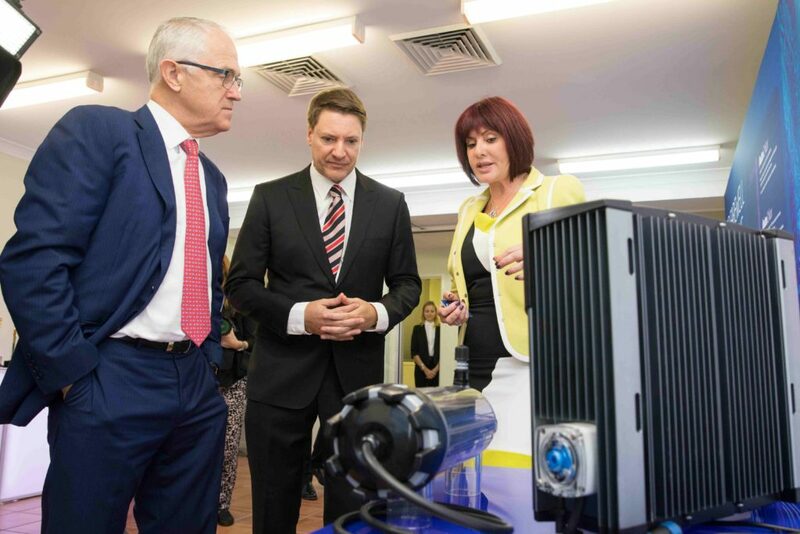 The Prime Minister commented that small-medium sized enterprises like AIS were “at the heart of Australia’s economic future,” and talked about their “commitment, courage and determination to keep innovating”. In welcoming the PM and Mr Vasta, AIS CEO Elena Gosse shared how the Federal Government’s recent announcement regarding future company tax cuts would help AIS to reinvest more funds into research and development, as well as fast track the further expansion of its production facilities. “We have always invested heavily in research and development and are currently in the early stages of building a new, purpose-built factory to house our Anode production line, Elena said. Elena also discussed the extension of the small business $20,000 Instant Asset Write-Off Scheme and its benefits to AIS customers, particularly local aquatic centres and swim schools. During the visit, the official party saw examples of AIS’ salt, mineral and fresh water chlorine generators for commercial and residential swimming pools, including the award-winning EcoLine™ system. Three EcoLine commercial units have recently been installed in the competition swimming pools at the Malaysia National Aquatic Centre in preparation for the KL 29th Southeast Asian Games. New ‘EcoLine Residential’ release going swimmingly. 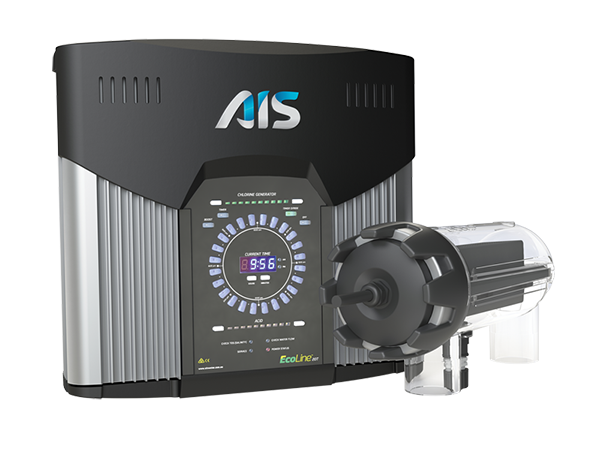 The recent release of Australian Innovative Systems (AIS) new EcoLine ™ Residential chlorine generator for fresh water swimming pools has been enthusiastically embraced by the market, with industry feedback indicating the system is a ‘game changer’ for home pool owners. “Our distributors and industry friends have told us that we have redefined the future of swimming pool chlorination, AIS CEO Elena Gosse said. “Our innovative technology has taken traditional salt water chlorination to a whole new level with EcoLine’s low salt operation combining the convenience, reliability and protection of a salt water system with the feeling of swimming in fresh water. The secret to EcoLine’s success is revolutionary technology that safely and conveniently disinfects water at TDS (Total Dissolved Solids) levels as low as 1,200ppm, when compared to approximately 5,000+ppm in a traditional salt water pool. “Home pool and spa owners can now enjoy all the benefits of swimming in fresh, clear water without worrying about water hygiene or the storing or handling of dangerous chemicals, Elena said. EcoLine Residential was developed over five years by AIS. The company has a commercial water disinfection system of the same name (EcoLine) that is already operating in luxury resorts, water parks and FINA standard competition pools worldwide. * Purchase in full before June 30 2017 and eligible small businesses could claim an immediate deduction for depreciation for investments up to $20,000 with the Federal Government Instant Asset Write-Off Scheme. To confirm your eligibility, seek advice from your tax agent or visit www.ato.gov.au. As part of the Australian Women’s Leadership Symposium series, Australian Innovative Systems CEO, Elena Gosse will speak on Inclusive Leadership in a panel discussion held at the Brisbane Convention Centre on Friday 19th May from 11:10am – 12:40pm. The Symposium celebrates women’s achievements and fields of endeavour with speakers recognised for their vision, resilience and capacity to influence change. Elena will be joined by fellow panellists; Abbie Wright, Diversity and Inclusion Manager with Aurecon, and Cath Brokenborough, Executive Lead Indigenous Engagement and RAP with Lendlease.